Like the '49ers before him, 17-year-old Duff Pringle leaves his East Coast home to seek his fortune in California. Obsessed with computer programming, he's been hired, sight unseen, by a Silicon Valley start-up. His $625 car doesn't even make it to the state line. 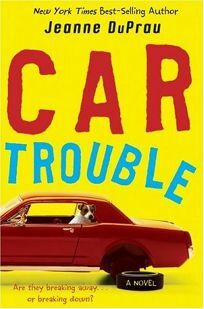 He quickly finds new wheels by checking Internet chatboards and discovering a ""drivers wanted"" ad, but against his mother's explicit warning, he picks up a hitchhiker, who everyone but Duff will immediately recognize as Trouble. Along the way, Duff loses his wallet, the company folds, and he nearly loses his life when it turns out the car he's agreed to drive contains a cache of loot. He also finds a new technological obsession-alternative fuels. DuPrau (City of Ember) is a smooth writer but Duff's story, like his car, has momentum problems. A self-described geek, Duff is a ""slave to shyness,"" and ""tortured by fear""; he's afraid of things as seemingly simple as talking to a girl his age. While this may be an authentic portrayal of a teen computer whiz, unfortunately it doesn't make for a very engaging point of view and the story's moral is ""listen to your parents."" Ages 12-up.